Valley Kitchen’s “Natural Alternative” is a blend of freshly milled whole flax seeds, organic whole buckwheat, gluten free oats, and organic whole corn. 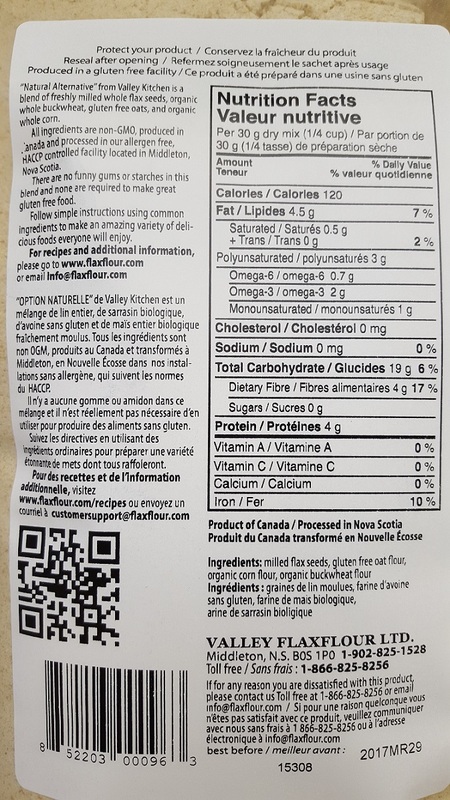 All ingredients are non-GMO, produced in Canada and processed in the Valley Flaxflour allergen free, HACCP controlled facility located in Middleton, Nova Scotia. No funny gums or starches are required. Follow simple instructions using common ingredients to make an amazing variety of delicious foods everyone will enjoy. Testimonial:I also tried a loaf of bread with the oat-based flour blend, which has a lovely texture and bite to it!~ Hannah M.
Check out our amazingly delicious and nutritious recipes using our flax products! We guarantee you will be pleasantly surprised by what you can do with flax! Enjoy food with benefits. Jamie Oliver`s Sweet Potato Muffins with a twist! Share: Finally an All-Purpose, Gluten Free Flour Blend! A natural alternative to wheat.